On April 21st, 2010, General Motors announced in typical marketing lingo that it had repaid the loans given to it by the US and Canadian governments because it was considered too large to fail. This announcement caused much discussion in the blogosphere, and ultimately resulted in some stark conclusions: At the end of the day, GM is still 61% owned by the US government, 17.5% owned by the UAW union of the workers who work in the plants and 11.7% owned by the Canadian government. Ordinary investors control, at most, a paltry 9.8%. Since direct government intervention into the car market is nothing new, it should be no surprise to the average US resident that government should extend its reach into the industry more directly. The question is not whether or not government is reaching farther than it ever has. Nor is the question really as to whether or not it is legal, since that is rather moot at this point. The best question to be asking is what the taxpayer has received in benefit from this intervention. n 1973 OPEC decided to raise the price of oil in direct response to the US resupply of the Israeli military. OPEC was at that time comprised of Algeria, Angola, Ecuador, Egypt, Iran, Iraq, Kuwait, Libya, Nigeria, Qatar, Saudi Arabia, Syria, Tunisia, United Arab Emirates and Venezuela, many of whom have been direct or indirect sponsors of violence and mischief against the United States as well as being price-gougers. In addition to much hand-wrangling, bureaucratic squabbling and other meaningful gestures, our government resolutely responded to this price-fixing with laws to control its own people more tightly. The first of these was the National Speed Limit of 1974. Always before, each state had considered their own needs and traffic flows to create speed limits based on the conditions on the ground; with the new law, this power was stripped from the 50 states and given to one single Federal agency to enforce one single, rather slow, maximum speed limit. The law was eventually repealed in 1995, but by then the 55 mile-per-hour limit had been imposed from Washington for almost a quarter of a century. The second law to show the Oil Exporters our determination to fight back was CAFE, enacted in 1975. Far from being repealed, these laws have been consistently tightened decade after decade. Additionally, many of the traditional all-American loopholes are in the process of closing, such as allowing suburbanite-beloved SUVs an exception as "light trucks." The stated benefits of the new laws was to quickly lower American consumption of oil leading to lower oil prices paid at the pump. This would be achieved through higher fuel economy and would secondarily cause an increase in driver safety. Prior to the National Speed Limit, typically states created speed limits with the intent of criminalizing the highest 10-15% of drivers on their roads. When a larger percentage was ignoring the speed limits, they would often raise the limits, either by informal polling of the population through ticket "sales" or through voter action in the booths come next election. By definition, either methodology would mean that most drivers were obeying the posted laws most of the time. A few years after the National Speed Limit was passed, multiple roads were monitored to see what the average driver was actually doing. Non-compliance with the new law was found as high as 83% by 1982 in New York. Now one could see direct government action leading not just to non-compliance of the general populace, but outright criminalization of the general populace, since New York responded to their drivers with conservative fines of $100 (1982 $) or up to 30 days in jail (or both) on the first offense and $500 or up to 180 days (or both) for a third conviction within 18 months of the first. And so a new generation of future Americans grew up helping their parents watch for cops on the highway so as to assist them in breaking the unreasonable and offensive laws of the land. What about fuel economy and lower oil consumption? While many analysts feel that the threat of future (in 1973) oil embargos was mainly broken by the finding of additional oil reserves in the Gulf of Mexico and Alaska coupled with growing exports from Russia, the embargo of 1973 was purely theatrical. It is unlikely that any adult who lived through the oil embargo will ever forget the lines of cars waiting for gas, but most of that occurred prior to the official start of the embargo! The sad fact is that as soon as the "promise" was made by OPEC to cut off the oil supply, our government stepped in to ensure everyone played according to their definition of "fair". Before OPEC had even turned off the taps, President Nixon tinkered with the economy and price-fixed the gas prices to ensure everyone had equal access. Of course, this caused the oil companies to be able to make far more money in overseas markets, leading to oil shortages in America without OPEC having even done anything at all other than bloviate. Did this market interference even trigger increased reliance on domestic supplies? No, quite the opposite: before 1970, the United States produced as much oil as we consumed each year. Since 1970 and until now, except for temporary recessions, oil imports have only continued to grow. Realize, however that in 2000 (the last census year, prior to the unfinished 2010 census) there were ~281,400,000 US residents who imported 10,419 thousands of barrels of crude oil and related products, meaning that 2,800 barrels of crude oil and related products were imported per resident in 1973, whereas 3,700 barrels each were imported in 2000. Based on this singular viewpoint, while vehicle gas consumption may have gone down for certain categories of vehicles, the total usage overall has increased. Even though fuel economy on a per-mile basis has increased through government fiat, the actual amount used by consumers has increased even as prices have increased! Why? Americans simply drive farther. More Oil Burnt, Are Cars Any Better? But cars are so much more powerful, and better all around than they ever were! So say the marketeers. Your humble correspondent purchased an old truck of uncertain lineage a few years back for a backup vehicle. It cost a bit over $1,000 and has absorbed about that cost again in maintenance over the past 3 years or so. It is a 1982 model and is guessed to have around 230,000 miles on it at this point. It is thought that while the engine has had significant work done on it, it hasn't ever been rebuilt. The drive train is of the right type to be original (though it could be from a similar vehicle that didn't need it any longer). Being older, it gets persnickety on a cold morning and requires a bit of time to wake up and get going. Occasionally it hesitates leaving a light or even stalls out if not given its 10 minutes to get nicely warmed up. However, it runs nice and smooth all the way to 80mph, gets ~17mpg combined mileage around town and highway and generally is extremely handy for any duty it is asked to perform. My 30-year old truck gets better mileage than newer models and has just about the same features and interior appointments. The driving characteristics are a little different - for example, the power train has no electronics so it doesn't accelerate unless I mash the pedal - but nothing a reasonably intelligent person cannot easily adapt to. No, it doesn't come with a TV, CD player, power windows, heated leather seats, or a backup camera. Are these things essential for personal transportation? Of course not! Fripperies are all very well, but with no fundamental improvements in 30 years, no wonder GM got in trouble. We should have just let it die; Mr. Obama bought us a pig in a poke. Phooey. Demosthenes is a guest writer for Scragged.com. Read other Scragged.com articles by Demosthenes or other articles on Environment. Funny.. this dated 11 dec 2008 "the House of Representatives on Wednesday approved a 15-billion-dollar (S$22.5 billion) government lifeline to the teetering US auto industry, ...".. when George Bush Ii was president.. why do blame Obama for something that predates his tenure? I agree GM sux, but it is only sating the consumers' appetite for gas guzzling monsters, w/ TVs for the kids. My antique BMW has heated seats, however, but it gets 25+ mpg. Bush gave GM a small loan: that was bad. 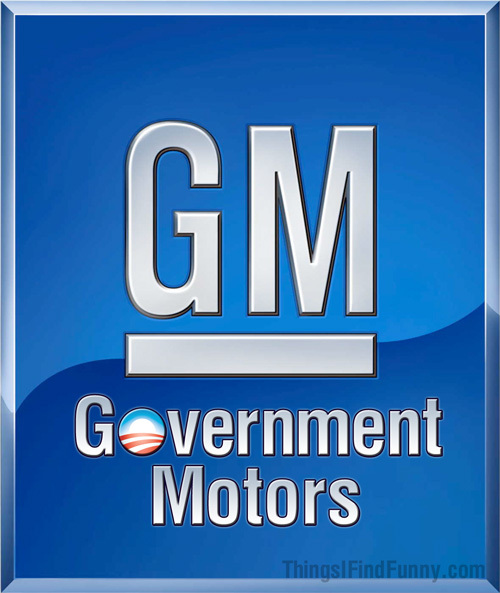 Obama gave GM a massive investment AND arranged for the unions to be bailed out and given ownership AND arranged for the government to have majority control: that was far, far worse. This was definitely one of the areas that Bush screwed up in. While Obama ended up nationalizing them, the entire process was started by Bush.